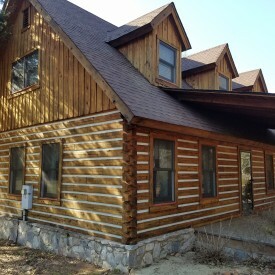 When it comes to log home restoration in the Florence AL area, there is none better than 888-LOG-GUYS! Our expertise doesn’t stop there! We also have over 15 years of experience in log home repair, log home chinking and caulking, log home improvement, and log home maintenance. We offer professional service at a minimal cost to you! We are dedicated to serving you to your utmost satisfaction! If you would like to know more about our services, or if you would like a free estimate, then give us a call! Or you could request a quote from our website! 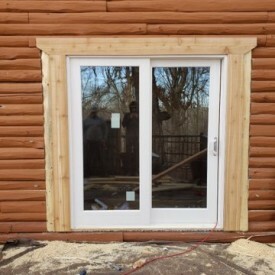 Our log home restoration process includes stripping off the old stain using media blasting (glass, sand, walnut, or corn cob blasting), and then sanding the logs before cleaning them with a borate treatment. Next,we would seal the logs with an energy seal (chinking or caulking) before finishing off with applying the best stain to make your home look beautiful. 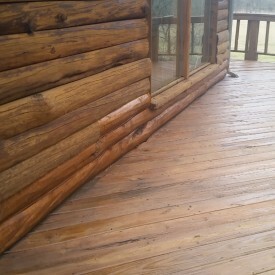 There is nothing quite like a refinished log home! If you have noticed that your worn and weathered logs need to be rejuvenated, then call us today! If you have been experiencing log rot, holes in your logs due to insects or birds, or damaged logs due to severe weather, then call 888-LOG-GUYS to fix your log home. Our crew has repaired or replaced thousands of feet of logs in the many years we have been in business. Don’t let you damaged logs stress you out! Call us immediately if you know your problems are affecting your log home condition! We will make sure your log home is safe and secure once again! Gaps in between your logs can cause many different types of annoyances. Are you dealing with invading insects or bugs? Have you felt air drafts around your windows? Have you seen water leaking through your walls after a rainy day? Whatever the issue may be, don’t put up with it any longer! Call 888-LOG-GUYS to seal or repair your current energy seal on your log home or log cabin with the best products of chinking or caulking! If there is something that you would like to add to your log home or log cabin, then ask 888-LOG-GUYS to do the work. 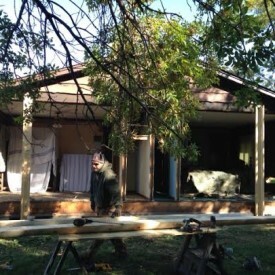 Our crew has several years of experience in constructing log staircase or log railings. We can also build decks, porches, or patios to beautify the outside of your log home. 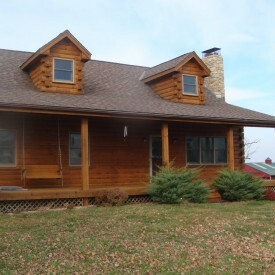 Give us a call to see how we can make your log home even more fantastic and increase its value! Whether you have used our services before or not, 888-LOG-GUYS wants to be there when you need a log home maintenance company to help you with your log home care needs in the Florence Alabama area. We can save you time and money by cleaning your logs every few years to keep them in excellent condition. And no matter what happens, even the unexpected, we will always be there to ensure your log home care is complete! Call us or ask for a quote online today to see what we can do for you!